It’s more important than ever today to invest in healthcare marketing. Consumers are bombarded with ads everywhere they go, and they have access to information like never before. Capabilities of a hospital, doctor specialties, rankings, reviews, infection rates, and more—all at their fingertips on smartphones—influence their opinions. And their options have multiplied: In addition to their local hospital and primary-care physician, there are physician-owned surgery centers, specialty medical centers, and emergency clinics vying for their business. There’s also medical tourism—where consumers shop around for the best price and travel across the country or internationally to undergo a medical procedure—making the entire healthcare industry more competitive than ever before, and the need for a healthcare marketing a must. You know this already: You have to engage your healthcare consumer in today’s disrupted marketplace. Due to the wide range of new healthcare options available, your patients have become highly informed, empowered consumers. Patients now see themselves as customers purchasing not only a service but an experience—for which the entire health system is accountable. Every aspect of healthcare delivery—from intake to website ease-of-use—is seen as a part of their provider’s “grade.” Their continued consumer engagement in healthcare, just like their initial provider interaction, must be consistently won. Marketers have a clear imperative: Provide experiences and build campaigns that show their health system’s value to the healthcare consumer beyond their provision of high-quality care. Patients want to feel as if they are in control of the way they receive healthcare services: Even if that “empowerment” is limited, experiences and campaigns should highlight patients’ power to customize certain elements of their care process. For today’s healthcare client, prompt responsiveness to issues with healthcare delivery is a given: Customer service now means clients have access to an array of service options that evolve along with their needs. As Accenture found in their study, we are all Amazon Prime primed as consumers now. So it should not surprise healthcare providers, plans, and suppliers that consumers expect just-in-time convenience for their healthcare. Use social media to openly “court” your patients. Wantedness might be expressed as an invitation to a live chat with a healthcare professional via a webinar or an “ask me anything” live tweet session that allows potential patients to “audition” providers. Consider ways to offer consumers a preview of your value-centered care model, and address their need for control in one go: Present the range of your provider’s services not as care options but as an ecosystem that responds to your patient’s desires and requirements. 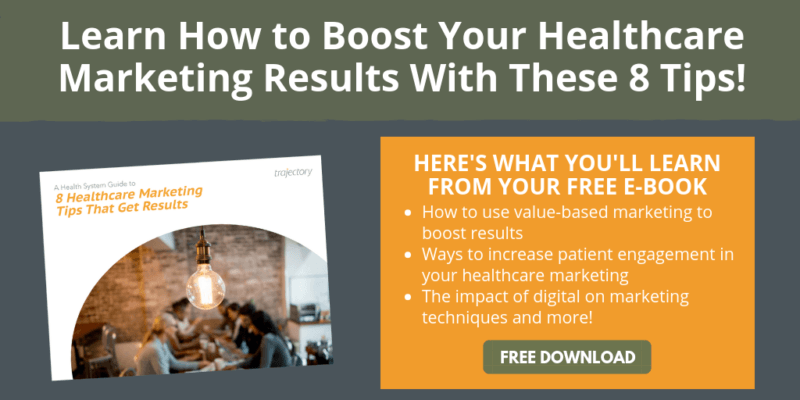 From weight-loss planning to longevity management, show how your organization (beyond your hospital) allows patients to establish wellness goals and use the resources across the entire health system as needed in order to live a healthier lifestyle. Your consumer should see themselves in the driver’s seat of their personal health, so emphasize your provider’s responsiveness to their directives. Efforts that encourage potential patients to “create” a wellness objective with a physician will be more attractive than one that invites consumers to “learn how” to live a healthier lifestyle. Engaging consumers further upstream—focusing on wellness, healthy life habits, and behavioral change, in fact, helping them thrive—will win their trust and loyalty. Engaging healthcare consumers around your brand is challenging in today’s disrupted market. Connect with us to book a free consultation. We’ll provide a fresh and insightful point of view. As healthcare marketers, we are natural storytellers. We transform Big Data’s deluge into insights on what drives our audience, and we craft narratives that speak to their unmet needs and desires. When we get it right, our stories are focused, believable, moving—raising brand awareness, strengthening differentiation, and even sparking a kind of nascent trust in our audiences. The difficulty of telling a memorable brand story, however, has intensified of late. New media platforms have created short-form, high-impact content that successfully competes with traditional storytelling techniques. Whether you’re transitioning into using new content formats or revitalizing a blog, here are three quick tips to help you create storytelling in healthcare that will keep your consumers engaged. Storytelling gives patients a “human” character to relate to who mirrors their unspoken concerns, which means that storytelling relevance requires a personal meaning. According to The American Press Institute, relevance is immediately apparent, specific, and demonstrated line by line. This isn’t the default tactic for healthcare marketing that one might think of when hearing the term “storytelling.” This is rich, data-driven meaning, infusing facts that might obscure the heart of your brand’s message.When successful, storytelling visually connects your healthcare system’s model of care to your audience’s innate desire to thrive, not simply live. A well-crafted story about a patient’s recovery will hit home when it underscores your hospital system’s role as a side-by-side partner in longevity, not just as a quality care provider.Watch UCHealth’s use of first-person storytelling in social video here. According to numerous studies, content authenticity leads to engagement. Brand stories shouldn’t be candy-coated. A story of a patient’s struggle shouldn’t gloss over hardship, but rather show how your hospital has the resources to meet a range of needs as they arise. Each point of conflict in your patient’s journey should find a resolution that explicitly illustrates your brand’s commitment to not just responding to, but anticipating client needs with sensitivity and a willingness to go beyond the expected. An example of a patient-focused feature story by The Shepherd Center is here. While striking an emotional chord is critical for a memorable campaign, the kind of stories that inspire action also have clear reasons for sustained engagement that are larger than the emotional themes attached to them. Build a connection based on an invitation to listen to your potential patient’s needs—present your provider as a multifaceted resource, not just as a steadfast caregiver figure in your story. Watch an Emmy-winning narrative video from Arnold Palmer Hospital for Children here and then read their educational blog, Illuminate. As a storyteller in healthcare, your desire to engage your audience should always drive you to make your healthcare marketing content smarter, richer, and more immersive. Let’s work together. Connect with us to book a free consultation. A 2016 study showed that 80% of consumers forget the entirety of most branded content after three days. According to research by The Economist Group, consumers ignore or simply can’t remember story-driven campaigns that put a brand’s self-interest messaging ahead of informational audience value. It’s no wonder that more than 60% of content-marketing campaigns fail to engage healthcare consumers. Consumers respond to brand stories the way they respond to other non-fiction content: A great story connects your audience with a journey that engages and builds anticipation for more: Anything less compromises not only brand messaging but your future ability to hold their attention through to the CTA. Consumers value authenticity above all. Your healthcare system’s mission shouldn’t only be described in terms of a philosophy. Focus on the direct impact that the exercise of your brand’s values has on the lives of the patients whom your hospital serves. Use humanizing descriptions (“130 kids went home to their families” rather than “130 pediatric patients recovered”) whenever possible to illustrate how your brand’s care model exists in real life. According to recent research, the right kind of healthcare marketing content can produce spectacular results; a Nielsen study showed 87% brand recall among consumers viewing a compelling storytelling campaign. Ignite user interest with videos or imagery that takes advantage of context to show the relevance of your brand messaging. Case in point: The Mayo Clinic’s use of a patient-centered narrative to connect value-to-patient with its legacy of innovative medical care. Watch the video here. A compelling story to engage healthcare consumers should be economical in words and format; leverage original, relevant imagery and a lean story structure for maximum impact. Static images have powerful impact just like video, and in some cases actually are more effective. Read a moving patient story from The Cleveland Clinic that uses images and a tight storyline to engage the reader here. Your brand’s story is unique; underscore elements of your health system’s commitment to consumers that highlight the originality of its customer-driven efforts. Make sure that your post or video leads the consumer to connect your health system’s stand-out qualities with a reason for further engagement. Read Ochsner Health’s succinct, highly-visual post on its app-driven customer service hub “The O Bar,” which encourages readers to learn more about how health tech and apps can help in the treatment of chronic diseases. Don’t overlook content elements like audio that can enhance your users’ story experience. While podcasts may seem like a throwback, a recent rise in popularity is making audio a must-have for compelling healthcare content strategy, according to some analysts. Listen to a sample podcast from The Mayo Clinic here. We’re here to help you create healthcare marketing content that engages and inspires your audience. Book a free consultation with us today. SMS marketing is back as a healthcare solution, delivering impressive response rates for marketers. The use of SMS, however, requires a deep understanding of the laws surrounding permission-based marketing. The myth that healthcare SMS marketing is prohibitively complex is just that—a myth. If marketers follow HIPAA regulations when developing their strategy, SMS marketing can be relatively simple. First, let’s take a look at some of the regulations relevant to SMS marketing. Perhaps the most confusing set of regulations for marketers, HIPAA directives regarding personal health information (PHI) are complex and leave some popular platforms—such as iMessage—labeled as non-compliant and therefore as especially problematic. You’ve probably heard the less-than-encouraging statistics—70% of consumers admit to disliking mobile ads and the number of ad blockers on smartphone browsers has increased by 90% since 2015. You might not be aware that despite consumer resistance to mobile display, SMS messages have an open rate of 98% and resulting conversions are above 45%. More than 90% of SMS messages are opened within three minutes of being received. According to a recent study by The Mobile Ecosystem Forum, more than 76% of consumers are already communicating with businesses via chat apps and SMS: Many consumers—millennials in particular—report that they prefer to communicate with brands via text. Despite the regulatory complexity that we’ve referenced above, it’s time to wade in. The most common motivation for consumers to share intimate personal data with brands is to receive access to deals, a 2017 survey by YouGov revealed. Millennials are the most willing to share detailed personal information (49%) for special offers, followed by GenXers (at 44%) and Baby Boomers (38%). For a healthcare consumer, a relevant offer might take the form of an exclusive health tech wearable. A few years back, Nivea developed a tear-out magazine ad that could be folded into a bracelet. The bracelet, which contained a GPS chip, served as a “kid tracker, ” which allowed parents to use an app that would trigger a text alert when their child wandered past a designated distance. The highly successful campaign won a Cannes Lions Grand Prix in 2014. Free access to a telemedicine health screening might also be an incentive for consumers to opt-in to SMS messaging. According to a recent study by West Monroe Partners, out of the 33% of consumers who have used a mobile app to communicate with their physician in real-time, more than 80% prefer virtual consultations. In addition, 59% of all consumers and 70% of Millennials stated that they would choose a healthcare provider who offered telemedicine services over one who does not. As a marketer, no one has to tell you that reaching your consumer means connecting with them on mobile. SMS marketing, for all its complexity, is one of mobile’s most appealing options. We’re here to help you navigate healthcare marketing strategy options and regulatory hurdles to bring your message to your audience at the right moment. Connect with us today for a free consultation. The Internet of Things (IoT) isn’t just a playground for software and entertainment industry marketers; it offers numerous opportunities for innovative healthcare marketers to reach prospective new healthcare consumers. First, let’s get a grasp of the marketplace. According to several recent studies, spending on healthcare IoT solutions is projected to top $117 billion, with the overall market growing to $1.2 trillion by 2020. The IoT comprises connected cars, connected/smart TVs, fitness trackers, smart glasses, smart watches, VR headsets, and other wearables. More than 60% of healthcare organizations have implemented IoT technology in their facilities, with 80% stating that the introduction of IoT reduced costs and increased innovation. For the majority of healthcare consumers, IoT devices are now the norm. In one study by the IAB, 62% of Americans own IoT devices and 65% are willing to receive ads on them. Another 65% of consumers who were aware of the devices said that they planned to buy one. According to the bulk of recent research, consumers will engage with ads or opt-in to share personal data with an app in exchange for an extra feature, a discount, or exclusive access to a relevant service. Marketers will find new opportunities to reach challenging demographics such as millennial and senior healthcare consumers by developing campaigns targeting specific IoT-connected devices favored by these groups, such as fitness trackers and smart TVs with health-monitoring apps. For millennial healthcare consumers, one of the most challenging demographics to reach, their pursuit of “wellness” often takes priority over conventional medical wisdom. Most millennials don’t schedule regular checkups with a primary-care doctor, many believing that holistic remedies, physical exercise, and eating right are the primary determinants of well-being. Not surprisingly, millennials are the leading users of fitness wearables. Leveraging this demographic’s penchant for adopting the latest trends in wellness will allow you to align your brand with their attitudes and lifestyle behaviors. Offer a personalized health-and-wellness challenge for consumers willing to share fitness wearable data in exchange for a complimentary telemedicine consultation at the end of the challenge period. Allow consumers to share their daily efforts through a dedicated app that connects to your health system, hospital, or physician group’s social media pages. Encourage the most active social posters to feature their daily triumphs on their own personal pages in exchange for personalized digital badges and shareable graphics that promote their achievements. Create a location-based “challenge map” that rewards users with special offers for visits to selected locations and the completion of various activities. An example might be the completion of a free blood-pressure screening at a health fair or participation in a yoga class, and then “checking in” by sharing activity and fitness data through the app. Whether you are targeting millennial IoT users or simply exploring the relevance of IoT to your healthcare marketing strategy, the range of possibilities can be exciting—and challenging. We’re here to help you cut through the noise. As you can see, as the healthcare consumer and the way he or she receives information has become much more complex—requiring your healthcare marketing strategy to become much more sophisticated than in years past. There needs to be continued consumer engagement, by way of storytelling, creating compelling stories, employing SMS marketing, and the use of IoT devices. A strong healthcare marketing strategy will create a loyal customer, which will only further your brand’s success. For help in developing your own custom marketing strategy for your healthcare brand, contact us today. We look forward to working with you and putting you in touch with your healthcare consumer.